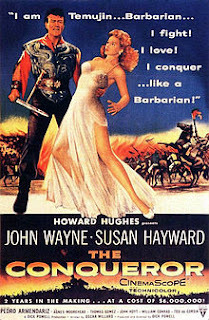 Previously we’ve learned that Spaghetti Westerns were often filmed in exotic, far-flung locations and now, via Super Punch, we discover that the desert of Utah has at least once been a stand-in for the steppe of Mongolia in the 1956 Howard Hughes production, The Conqueror, starring John Wayne as Temujin (nom de guerre, Genghis Khan), Susan Hayward as his first wife, Börte Üjin, and Agnes Moorehead as his mother, Hunlun. The film was critically panned and a financial flop (Hughes’ last cinematic venture) and never attained a cult following due to a weak plot and what was recognised as gross miscasting (plus general unavailability—more to follow), but there’s a dark and unexpected footnote in the movie’s production, which spanned three years and leaves a greater legacy of questions. Weeks were spent on location shooting outdoors and establishing scenes and once the cast was ready to return to the studio, Howard Hughes shipped sixty tonnes of native dirt back to Hollywood in order to make sure that the terrain’s appearance matched and ensure continuity. Cast, filmmakers and residents knew that the filming site (and imported soil) was directly downwind from the Nevada proving grounds where the military had tested eleven surface nuclear bombs and munitions a couple of years previously but any concerns that they had were placated by assurances from the government that there was no risk to public health. Nearly half of the two hundred member crew, however, developed cancer, which a quarter succumbed to. Wayne and Moorehead both died of cancer in the 1970s and were heavy smokers (Wayne’s habit was six packs a day) but the actual cause remains a mystery. In the aftermath, anguishing over his decision to shoot in a dangerous and radioactive site, Hughes bought every copy of the film and kept it out of circulation for several years—until the studio re-acquired it from Hughes’ estate after his death. Reportedly, it was one movie that Hughes watched endlessly during his final years.